Making the step up to a musical instrument offering professional features is an important decision for all musicians. The step-up instrument is the bridge that often transforms the budding student into the professional artist. Choosing the right instrument can lead to significant musical progress, as well as great success and accomplishment. 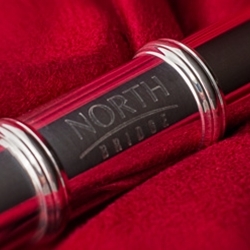 North Bridge offers a unique family of intermediate level flutes, which allow the flutist to find their musical voice and to develop a full, rich, and beautiful sound.